Deputy Goins is contracted through the Clermont County Sheriff’s Department to patrol Monroe Township. • Do not leave valuable articles in plain view in your automobile and lock your car when you leave it. Remember to take your keys with you. • Lock doors and windows in your home. • If you are working in the yard, lock the doors on the opposite side of your house. If you are in the rear, lock the front and while in front, lock the rear. • When you are going to be away for an extended period of time, stop mail and newspaper delivery. • Place lights on timers in different locations throughout the home. • Notify a trusted neighbor of your absence and where and how they can contact you in case of an emergency. • Call police whenever you see something suspicious. Call when you see it, not two or three days later. • Video tape the interior of your home and show all items; especially valuables. Keep a list of model and serial numbers on everything that has a number. What are the office hours of the Township Law Enforcement ? The Police Department operates on varying shifts, usually during peak hours. It is best to call the Clermont County Communication Center at 732-2231 and have them contact an officer who is in the field. What is the best way to contact the Township Law Enforcement? If it is a true emergency, call 9-1-1 If it is something that is not an emergency (to report something that happened several hours or days earlier, mailbox damage, etc.) call the Clermont County Communication Center at 732-2231. How do I obtain a copy of a police report or accident report? 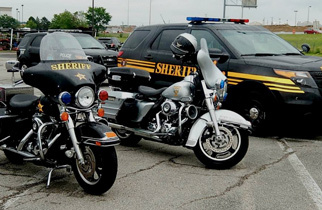 Reports are available from the Clermont County Sheriff for a fee. Insurance companies will usually request a copy and pay the fee. How do I get fingerprinted for employment? Any Township resident can get fingerprinted at the Clermont County Corrections Department. There is no fee for this service. What should I do when I leave for vacation? Call the Clermont County Sheriff's Department and request that they conduct a vacation check of your residence. Information needed: Name, address, phone number, cars in driveway, lights on or placed on timers, status of mail/paper, if there will be a dog on the premises, if there will be a key holder/contact person and if there is an alarm system.